Sunny days are few and far inbetween here in Tours, but yesterday the sun was out and everybody was outside, soaking up all of the goodness and warmth and uplifting enegy it provided. I walked up to our little town of Montlouis sur Loire, following the sun everywhere it went. This is one of the oldest houses, situated next to the church, which is being restored at the moment and mostly hidden behind drapes and plastics, but it already looks so beautiful and I’ll definitely get it down in my sketchbook once it is done The men working on it, get such a great kick from being watched and they almost put up a show when you express your appreciation for the great job they do. They just bloom…and don’t we all, when what we do is just in a little way appreciated? Watercolour in sketchbook, 19 x 25cm, Fabriano CP. 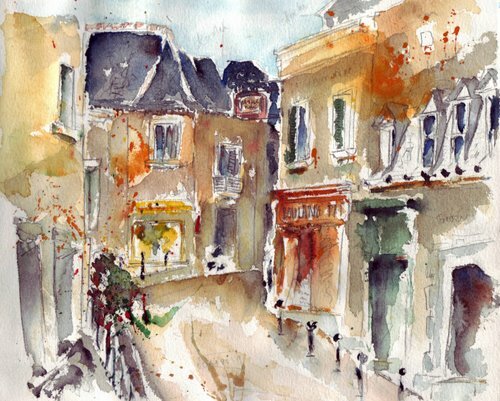 The second sketch is the main street of the center of Montlouis sur Loire. We have a Boulangerie with a Charcuterie next to it, and the little yellow building is our Coiffeur. To the left we have our Fleuriste and when you continue the road to the right, you’ll reach our DVD-shop , which is owned by our Boucher. We order all our meat from him as well as our DVD’s. He is such a nice man, soft-spoken and really cares about quality service with a smile. He’ll explain the best method to cook a röti with the same dedication as showing you a clean DVD. Lovely and evocative, Ronell. So glad you had a sunny day. So beautifully loose and colourful, absolutely gorgeous! Ronell, these are wonderful, loose paintings in your typical style! Very nice! Ronell, you live in a charming town!! 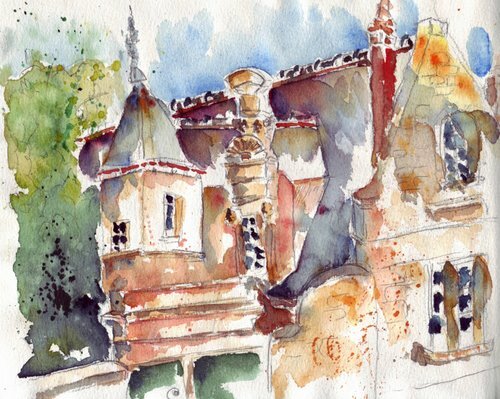 I love both sketches – to me theyare more than that – paintings.They show so much of the character of the buildings, I can surmise the rest of the town is as picturesque. Thank you for commenting on my 100th post to my Blog. What better way to enjoy a sunny day doing these charming sketches! Such a charming village, and Sun just makes everything better (a lot like chocolate 😉 And as always your lovely loose free spirited style! wonderful sketches. so loose! I also love the palette you used, there’s so much quality in the touch of the brush to the paper; it’s a cool way to show us your neighbourhood. I want to see moooore! Ronell! Your work exemplifies the look I so long for — painterly, beautiful … so rich!!!! I am in awe! Unbelievably charming and the colors are to die for!! Ronell! these are so pretty to look at! I feel like I am there. Thanks for sharing! Oooooh, your watercolor sketches are sooo fun to look at. Who wouldn’t love to have your style. Wonderful use of color, Ronell! I’vebeen missing your work lately – I hope soon I’ll have free access to internet again. You really captured the heady feeling we all had when we looked out the window and there was finally sun again! Oh, if only it could come back today….. These are so loose and lovely, mine get so tight and over worked (sigh)! You make it look so simple! Glad you had a nice sunny day, I can almost see you stretching like a kitty in the sun! What a party of color! Gorgeous! Ronell how wonderful you had a day of sunshine chasing. Your paintings are beautiful and inviting. We have so many sunny days I come to expect them, we are happy to have the few days of rain and “weather” here. I know that I need that sunshine, it warms my soul and gets me moving. I hope you have more sun filled days that will bathe your paintings with light. These are so beautiful Ronell. Wow — feels like home, Ronell. I love the explosion of color. I love the fact that tu loues tes DVDs chez ton boucher 🙂 Incroyable mais vrai! Gorgeous sketches, Ronell. Rich and with your characteristic fluidity. It’s like these buildings are melting into pure color. I find both sketches gorgeous (it’s hard to call them sketches, they’re true paintings to me) and I loved the stories behind them as well. Oh, wow – these are glorious. Your way with getting colors to mix on the page is enviable. Such lovey warm colours and such a fresh touch as ever. Your work always makes my mouth water Ronell! Beautiful sunny paintings. What a pleasant sight compared to what I see when I look outside my window (only grey and cloudy weather). I imagine myself walking along the streets of your town and stopping in to buy fixings for a wonderful meal! These are so lovely and it’s fun getting to see the place where you live. I just love the composition of the second painting. this is such a nice watercolor -so fresh and loose! I really love the gorgeous splashes of colour in that first sketch! Great teaching aid to use the complete post. .. if only we could print it out for students. The more thoughful approach with colour harmony paid off as did your patience. Enjoyed reading your mind as you went along. Enjoy South Africa. I had 5 weeks there painting and sketching last Sept/Oct and have a 100 page 6 x 8 inch journal full of sketches with pen and watercolour, plus lots of text entries of stories I came across and sights and feelings. One day I’ll probably make a new blog to put it all together for possibly printing as a travel art journal. Its full of people, animals, birds, flowers, landscapes and buildings. Have a great time.